Kava Kava induces a pleasant sense of tranquility and sociability after it is consumed. With moderate use of Kava Kava, the consumer remains in control of his moral conscious and reason. He attains a state of well-being and contentment, free of physical or psychological excitement. He never becomes angry, unpleasant, quarrelsome or noisy, as happens with alcohol. When consumption becomes excessive, the limbs become tired, the muscles no longer seem to respond, walking becomes slow and unsteady, and the consumer appears partially inebriated, and often falls asleep. Unlike alcohol, drinkers of Kava Kava do not experience hangovers. The Kava Kava drinker will awaken having recovered normal physical and mental capabilities. When consumed in large amounts, Kava Kava imparts a euphoric state. This could be why some people regard Kava Kava as an aphrodisiac. Kava is anti-septic, anesthetic, narcotic, and a diuretic. It has been used for both acute and chronic gonorrhea, vaginitis, syphilis, leucorrhoea, nocturnal incontinence, urinary infections, irritable bladder, gout, rheumatism, bronchial ailments, and other ailments resulting from heart trouble. 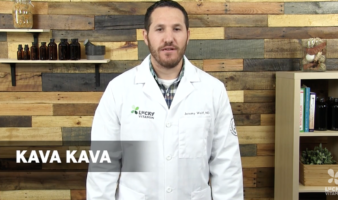 Dr. John R. Christopher recommended Kava Kava as a cardiac stimulant. Kava Kava has been recommended for insomnia, depression and anxiety. Kava Kava works on the central nervous system, and promotes relaxation to those suffering from anxiety or depression. Because of the relaxant properties of Kava Kava, it is beneficial in treating menstrual cramps as the Kava Kava will relax the uterus. Kava Kava is an excellent anti-anxiety herb. Many people who have anxiety report that the anxious feelings leave or diminish when they begin taking Kava Kava. Studies have been done to show that Kava Kava is far superior to a placebo when treating anxiety, but are sadly lacking to show that Kava Kava is superior to anti-anxiety medication, such as Valium. Unlike many popular prescription drugs, Kava reduces anxiety but does not impair mental function or cause sedation. In a double-blind crossover study conducted in Switzerland, the effects of Kava on short-term memory were compared with those of the anti-anxiety and muscle relaxant drug Oxazepam. While the drug was found to impair short-term memory, Kava actually improved it slightly. And, when you look at the possible side effects of Kava Kava versus anti-anxiety drugs, it is easy to see that Kava Kava is a safer choice for almost everyone. Kava Kava has long been used by Pacific Islanders as a pain reliever. Kava Kava will help relax tired, sore muscles. It also helps to provide a restful sleep to those suffering from insomnia or restlessness. James Duke mentions that when you chew the leaves of Kava Kava your mouth goes numb. As a result, this plant might be used to relieve the painful symptoms of sore throat, sore gums, canker sores, or even toothache. In Hawaii, children were given buds of Kava Kava to chew on when they were teething. Quite possibly, Kava Kava could be used as a local anesthetic. Kava Kava can be used in place of aspirin, acetaminophen, and ibuprofen. Due to its anti-inflammatory properties, Kava Kava could be useful in treating gout and cystitis. Dr. John R. Christopher recommended that Kava Kava be used to prevent, relieve or even cure rheumatism. He also recommended it in any other cases where you would need an anti-inflammatory herb. Kava Kava can be used externally for ringworm and athlete’s foot. Traditionally, Kava Kava was given to feverish or restless children to help them go to sleep. Kava Kava has been traditionally used by Hawaiian healers to help sufferers of asthma. More studies need to be done to prove Kava Kava’s efficacy as a treatment for asthma. Dr. Christopher mentions in his writings that Kava Kava can be used for broncho-pulmonary ailments. Dr. Christopher recommended using Kava Kava to treat kidney infections, or other urinary disorders. He also mentioned its properties as a blood-cleansing herb, and also as a diaphoretic. Kava Kava has also been used to calm down enraged animals, although the exact properties of the herb that influence this action are not known. High doses of Kava Kava are unnecessary, and should be discouraged, as a small amount will give the desired medicinal effect. A few people have reported blood in the urine, shortness of breath, increased red blood cell volume, and decreased platelet counts after consuming large doses of Kava Kava. However, these reports are suspect because the subjects also reported heavy alcohol and cigarette usage in addition to the Kava Kava. A few cases have been reported of people with Parkinsons’s disease being adversely affected by Kava Kava. The continued use of Kava Kava in large doses will result in inflammation of the body and eyes, and can cause leprous ulcers; the skin becoming parched and peeling off in scales. This condition is known as Kani, named by the Pacific Islanders. At one time, it was thought that Kani was caused by an interference of Niacin. However, in one double-blind, placebo-controlled study no therapeutic effect with Niacinide (100 milligrams daily) could be demonstrated. The only known was to deal with Kani is to reduce or cease consumption of Kava Kava.